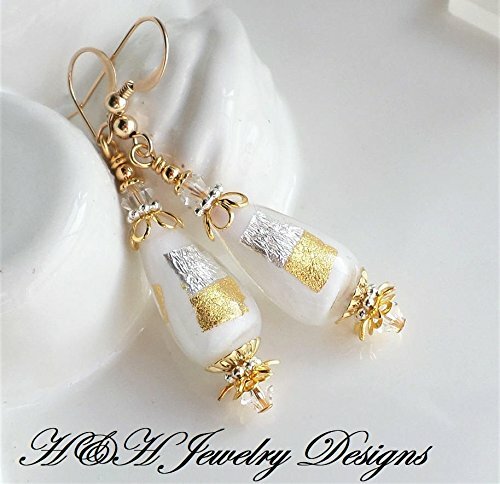 White Gold Silver Murano Glass Earrings by H&H Jewelry Designs at Nicky's Blog. Hurry! Limited time offer. Offer valid only while supplies last. Stunning new Murano glass beads are the focus of these brand new earrings! The pear or teardrop shaped white glass beads measure 3/4 inch long each. Stunning new Murano glass beads are the focus of these brand new earrings! The pear or teardrop shaped white glass beads measure 3/4 inch long each. They feature the white glass core that is heavily accented with small sheets of genuine 24KT and sterling silver foil, seen on both sides of the beads. The beads are then encased in layers of clear Moretti glass helping to protect the foils. So absolutely gorgeous! I have added Swarovski clear crystals to the tops and bottoms, along with a pretty selection of silver and gold brass elements. The ear wires are genuine 14KT gold filled with a ball and coil accent. Total length: 2 1/4 inches.